This enormous, squid-like creature inhabits the Seas of Ire, where it hunts for all manner of prey—including unsuspecting ships. 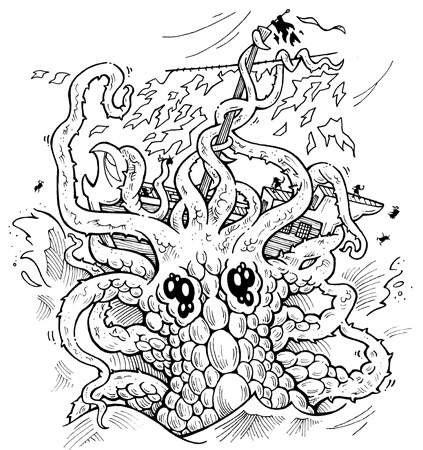 The scoptacus has anywhere from twelve to thirty long tentacles. Each one is lined with a double row of sharp pincers that are used to gash, cut, and impale. The scoptacus also has two clusters of large bulbous eyes. Its bumpy scales are greenish in hue, but the true shape of its body is unknown, for few have ever encountered one of these creatures of the deep and lived to tell about it. While Kendra Kandlestar was traveling to Krake Castle, she came face to face with a scoptacus when the deadly beast attacked the gnome pirate ship on which she was imprisoned.